Visits to the Geopark can be booked throughout the year Monday - Friday and on some weekends and evenings. Visits can last either a full or a half day (See Group Charges for more information). 1:6 for under 8 year olds and 1:15 for over 8 year olds. The group leader is required to ensure that they bring enough adult helpers to fulfill the relevant requirements. 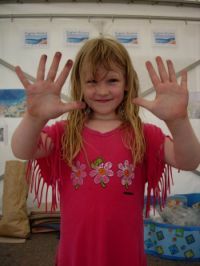 We also recommend a maximum group size of 30 children per member of Geopark staff. Full risk assessments are available for all of the activities run by Geopark Staff. The relevant risk assessment(s) will be sent out to the school once a booking has been made. If you would prefer, we are happy to help schools to prepare their own Risk Assessment. Please insure that you inform us of any medical conditions or disabilities that we should be aware of when you make your booking. Parental contact details should be brought with you and the child(ren) concerned should make sure that they have the relevant medicines with them at all times (e.g. asthma inhalers). All Geopark education staff are CRB checked and First Aid qualified and will be carrying an approved First Aid kit during the visit. However, it is the school's responsibility to ensure that one of the visiting staff is a qualified First Aider with a First Aid kit. It is that member of visiting staff who will then administer any first aid required. It is a recommended that this visiting staff member also carries a mobile phone and gives their number to us at the start of the visit. We will also carry a mobile phone for the duration of the visit in case of an emergency. We complete accident reports for all accidents requiring First Aid treatment. We are unable to give out or administer any medicines, creams or sprays. For bites, stings or sprains we are only able to provide cold water to relieve symptoms. The English Riviera Geopark Organisation has full public liability and employer's liability insurance. Please report any items lost or found to the member of staff leading your group.